As I boarded the Celebrity Eclipse in Southampton two words reverberated from the British passengers around me. Brilliant and stylish. 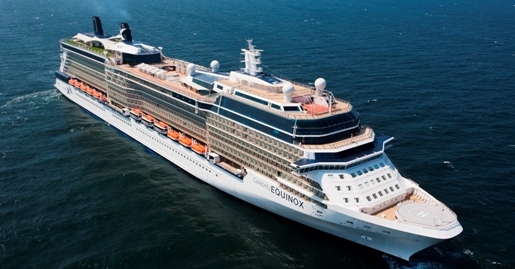 The wow factor is exactly what Celebrity Cruises is striving for on Eclipse. But before the line’s newest ship carried any paying passengers it was called to carry out a mission like no other. Eclipse didn’t set out to be a hero ship on its first cruise with passengers, but that’s just what happened right after it left the shipyard. The vessel’s late April inaugural celebrations were put on hold to participate in a unique and unprecedented rescue mission. Eclipse sailed to Bilbao, Spain to pick up more than 2,000 British tourists stranded by the shutdown of European airspace following the Icelandic volcano eruption. Simon Weir, Eclipse’s hotel director noted that a party at that time was frivolous. “We had a window of opportunity to do something extraordinary – we had to help out.” And, boy did they. Rescued tourists traveled back to England in the lap of luxury onboard the 122,000-ton, 2,850-passenger Eclipse. Weir said many rescued travelers told him Eclipse was far better than the land-based vacation they had in Spain and were sold on sailing the ship for their next vacation. The line hit a homerun with the launch of Celebrity Solstice two years ago and Eclipse carries on the captivating qualities. Like its two sister ships (Solstice and Equinox) the big appeal is the seamless blending of differing characters throughout the ship. Passengers who have been on the aforementioned sister ships will find themselves in familiar territory. Eclipse offers The Lawn Club, with real, growing grass; The Hot Glass Show, a glassblowing show and studio developed with The Corning Museum of Glass; 10 dining venues, along with vast entertainment offerings including shows with breathtaking aerial acts. But there are some interesting new additions and changes. There are some cosmetic differences with the interior color scheme, artwork, and various refinements that make the ship even smarter and improve the overall guest experience. One very welcomed change is the modification of the entrance area to the AquaSpa that separates the spa reception area from the entrance to the gym. The previous design had guests funneling through the spa reception area to get to the gym. Tweaks in the design aside, it’s the new offerings onboard that are making this ship better than its predecessors. The most unique addition is Qsine, a new restaurant by Jacques Van Staden, Celebrity’s vice president of culinary operations. Qsine turns the dining experience upside down—literally. The quirky venue is enveloped in avant garde décor, furniture, and large table lamps hanging upside down from the ceiling. Even the menu presentation is gimmicky – diners are given Apple iPads with descriptions of the main menu offerings and the desert menu is a paper cube that you unfold to find the selections. The menu features childhood favorites with contemporary touches served in small portions. It’s all-you-can-eat for the $30 cover charge. The food was delicious and a lot of fun. The menu selection called Crunchy Munchies is an assortment of fried items presented in a paper cone. Sushi lollipops are served on a stick. Spring rolls are presented in vertical springs. An assortment of three cold soups is served in test tubes with a straw. Popcorn fish and chips were served in a red-and-white popcorn box. Other options include Kobe sliders, ceviche, tacos, and lobster and escargot fritters. Another new feature on Eclipse is the Celebrity iLounge, a hip computer center stocked with Apple products, including 26 MacBook Pros. The ship also is authorized to sell Apple products as well as offer classes on how to use them. The iPhone/iTouch classes onboard were standing room only. Clearly a big hit. Weir tells me that Celebrity no longer competes with other cruise lines but with the great hotels of the world like the Bellagio. “We’re not just an American product, but an International one and we will adapt to sailing in differing regions,” added Weir. Celebrity is targeting the cosmopolitan, upscale resort crowd and the Solstice-class ships like Eclipse are the perfect bait. It’s a large ship with a lot of passengers, abundant space, yet it’s still intimate and rarely feels hectic or crowded. Best of all it manages to be two things that many cruise ships aren’t these days — to be exhilarating and classy at the same time. Celebrity Eclipse cruises its inaugural season with sailings from Southampton with various cruises ranging from 14-night Baltic and Mediterranean sailings that begin at $1,913 per person. On October 31, the ship will sail a transatlantic voyage to Miami, Florida, where it will begin a series of alternating 7- night Eastern and Western Caribbean voyages through April 2011. Prices begin at $649 per person. All aforementioned prices are based on inside staterooms, double occupancy. Visit Celebrity Cruises Web site for more details. Filled Under Advice, Cruise Profiles, gallery, Reviews, What's New? Love the Lawn club – the real patch of grass on Eclipse’s highest deck – very surreal!